Just over 12 months ago, Sharone Vernon-Evans was the recipient of oohs and ahhs in gymnasiums across Ontario as his Mississauga Pakmen held court in Ontario Volleyball Association action. From his jaw-dropping leaps to his heart-pounding spikes, club players and parents alike knew the young 17-year-old would be a special player some day. But no one anticipated that day would come so soon. While all of his U18 Pakmen teammates took their talents to the well-traveled and proven college and university routes, Vernon-Evans seemed to disappear from sight choosing to go east and attend the national training centre in Gatineau, Quebec. Vernon-Evans’ transformation at Canada’s top secret lab, under the tutelage of first-year senior men’s coach Stéphane Antiga and the rest of the national staff, has been nothing short of stunning as the 6-foot-9 opposite developed more muscle tone, gained further confidence, and displayed an understanding of the sport very few, at the young age of 18, ever grasp. In one short year, the Pakmen alumnus has risen to become Canada’s new face of volleyball. For, not only did Vernon-Evans lead Canada to a bronze medal at the U21 Pan American Cup in Fort McMurray, Alberta in June, he followed that up by leaping into international prominence by helping Canada sail through uncharted waters at the FIVB Volleyball World League, winning yet more bronze. Missing some talented household names, including star Gavin Schmitt, who retired after Canada’s surprising fifth-place showing at the Rio Summer Olympics, little was known, nor expected of this Canadian squad headed up by Antiga. But surprisingly, Canada kept advancing through the stages upsetting a number of established powers before coming from behind to knock off the United States for the bronze medal in Curitiba, Brazil in early July. It was easily Canada’s best showing in the history of the prestigious tournament and it proved Canada’s arrival as an international volleyball threat was no fluke. Previously, Canada’s best-ever performance was a fifth-place showing in 2013, when they qualified for the final round, but lost both their opening matches in Mar del Plata, Argentina. In 2016 they topped Group 2 with an 8-1 record in pool play before beating Turkey in the semi-finals and hosts Portugal in the final in Matosinhos to place 13th overall and get promoted to Group 1 this year. And, helping to pave the way, was Vernon-Evans, who stepped into the opposite hitter’s position vacated by Schmitt and held his own despite being the youngest player at the tournament. Somewhere in between all of those accomplishments, the Scarborough native found the time to sign a professional contract with Poland’s ONICO AZS Politechnika Warszawski and, according to the International Volleyball Federation (FIVB) post the second best vertical jump in history (behind Cuban legend Leonel Marshall) by touching 12-feet, 6.5-inches in April. So what did the rising Canadian star do after returning from his whirlwind successes with the bronze medal in tow? The answer was a no-brainer for the friendly 207-pound giant, who turns 19 at the end of August. “One cool thing is when he arrived he went straight from the airport to David Leeder to see his Pakmen family with his bronze medal around his neck,” said jubilant club founder and president Kelly Smith. Vernon-Evans’ former beach coach Jessy Satti was more than happy to act as chauffeur. “By the time we got there the camp kids were finished, but he got a chance to see some of the rep beach athletes train and they were excited to see him. Without saying as much, one could detect Satti was a little starstruck by his former student as well. Having coached Vernon-Evans since the Agincourt Collegiate graduate was a gawky 13-year-old, Satti has more of an insight into his protege’s growth than most. For his part, Vernon-Evans didn’t require any twisting of his enormous 7.54-foot wingspan to head over to the Pakmen club. “It was a trip down memory lane and I got a little bit nostalgic just seeing the little kids playing,” admitted Vernon-Evans. Nostalgic, and perhaps a little misty eyed, Smith seems to be in disbelief at how much Sharone has grown and matured into a formidable star while still being a teenager. Smith proceeded to list some of Vernon-Evans’ accomplishments as if to convince himself of his stratospheric accomplishments. “At 18 years, (Sharone) became the youngest Canadian to start in the World League and the youngest Canadian to turn pro. Asked to come up with another Pakmen graduate who made such an impression internationally, Smith didn’t have to ponder too long. “Sharone went from Pakmen U18 directly to the National team program and now is the star for Canada in World League play. “No one really compares among Pakmen alumni. We’ve had players in the National team program and players who have played pro, but Sharone is the first to make the National team,” said Smith. “(In fact) very few players from Ontario ever make it. It’s mostly players from the west. “(While) In beach, we had Daniel Dearing who played on the team for a few years, but retired due to injury. Felipe Humana-Paredes is currently a member of the beach team and he is a Pakmen Alumni. Helping to mould Vernon-Evans to the player he’s become in the indoor game is none other than club head coach Orest Stanko. Unlike the majority of observers, Stanko is not shocked at Vernon-Evans’ rise to celebrity status. He’s merely caught off guard at the pace in which he’s gotten there. “I’m not the least bit surprised that Sharone was selected to the National Team and that he will be playing in one of the top professional leagues in the world. (However) I must admit I am a bit surprised with how quickly he has adapted to the international game especially given that he is (soon to be) 19 years old. That simply underscores the depth of talent this young athlete embodies. Asked if he felt he’d aged 10 years since leaving Pakmen, Vernon-Evans concurred it has been a frenzied time. “I still feel young and alive, but I have matured significantly since I left home in September, 2016,” said Vernon-Evans after his return home from Brazil. That list of destinations included Novi Sad, Serbia; Varna, Bulgaria and Antwerp, Belgium during the first round of play in FIVB World League action with Canada finishing with a 5-4 record beating Belgium twice, United States, Bulgaria and Italy, while dropping matches to Serbia, Brazil, Poland and France. Qualifying for the medal round in Curitiba, Canada opened with a 3-1 loss to the hosts from Brazil, rebounded with a thrilling 3-0 (25-23, 29-27, 25-17) whitewash of Russia with Vernon-Evans scoring a match-high 13 points, and lost to eventual gold medalists France in the semi-finals, before clinching the bronze, with Vernon-Evans and Graham Vigrass scoring 12 points each, one fewer than captain Gord Perrin, with 13. In total, the Pakmen grad turned some heads by scoring 53 points in the Finals. Vernon-Evans admits he’s even surprised at how much of a jump he made up the Canadian senior men’s ranks. “I have worked really hard to get there, but I am still very surprised that I had the opportunity to play with this team this summer and start some matches. Vernon-Evans tips his hat to Canadian head coach Antiga for much of his recent accomplishments. A former star of the French national team from 1998-2010, Antiga had success heading up the Polish program, helping them finish fifth in Rio, along with Canada, before replacing Glenn Hoag as head coach. “He’s a quick study, very strong physically and a high jumper,” said Antiga of Vernon-Evans. Antiga says he noticed ‘Sho’ when first appointed the senior men’s coach in mid-December. 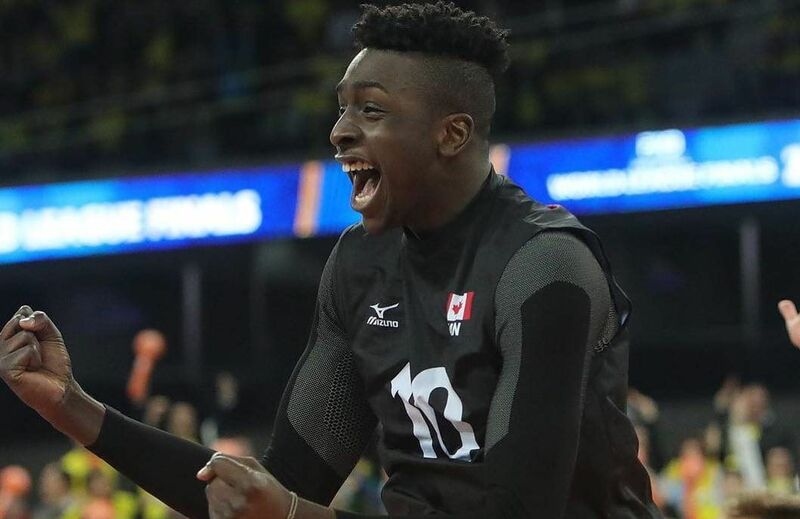 Antiga kept tabs on Vernon-Evans as he flipped back-and-forth between the national junior and senior teams with older players and opposite spikers Bradley Robert Gunter and Rudy Verhoeff. Antiga noticed from the get go that Vernon-Evans “was (already) an amazing jumper, but (he) was fully involved in defense, which I really like. In regards to Canada’s overall performance on the world stage, Antiga added, “We didn’t start well, we made a lot of mistakes, but then everybody contributed to this victory, everybody played their role. The bond between Vernon-Evans and Antiga has developed so strongly that the two will continue to work together in Poland with the Warsaw club, where Antiga is the head coach. Playing in Warsaw will mean yet another challenge. Taking on professionals and taking on a new language and culture head on. But, considering Vernon-Evans’ accomplishments over the past calendar year, few doubt the young Scarborough native won’t pass with flying colors. While Vernon-Evans admits he has no grasp of the Polish language, he’s already being proactive. Canada’s next challenge will be the NORCECA Continental Championship, from Sept. 24 to Oct. 2, in Colorado Springs. The top five teams will qualify for the 2018 FIVB World Championship. “We will keep working hard during the next club season in Poland,” added Antiga with an eye on the 2018 world championships. The ultimate goal is to focus and qualify Canada for the 2020 Tokyo Olympics.